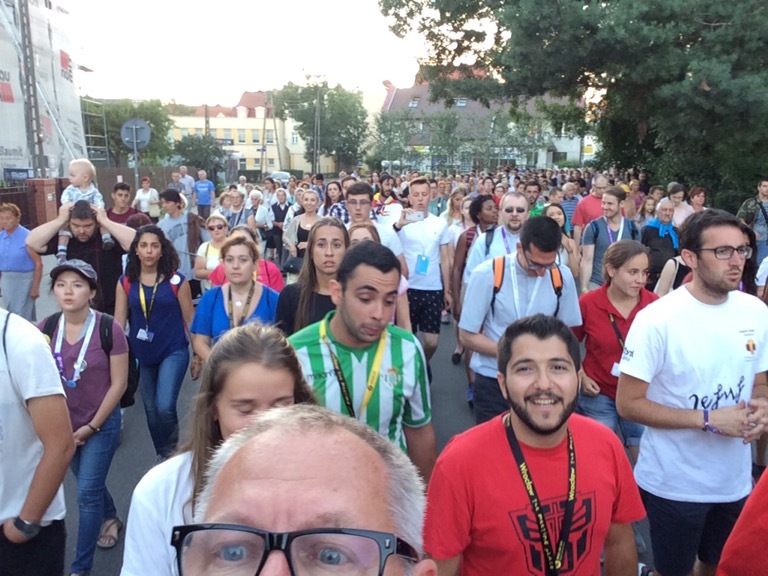 There is a reason that World Youth Day is for those aged 18-35! After day one and two, which were astounding here in Wroclaw, this 60+ pilgrim is exhilarated but exhausted. After our long overnight travel day we finally arrived in Wroclaw to an incredibly warm reception from our host parish of St .James and St Christopher which included the traditional welcoming ceremony of the sharing of bread and salt followed by a beautiful prayer service with our host families followed by tables of awesome Polish treats! The plum cake was a huge favourite! After our pilgrims safely off with their host families for the night Fr Kuzma and I were invited to join the pastor for a late supper! More fabulous food! Day 2 began with our own celebration of Mass in the parish church followed by a visit and tour to a home for mentally challenged women run by the Sisters of Mary Immaculate. 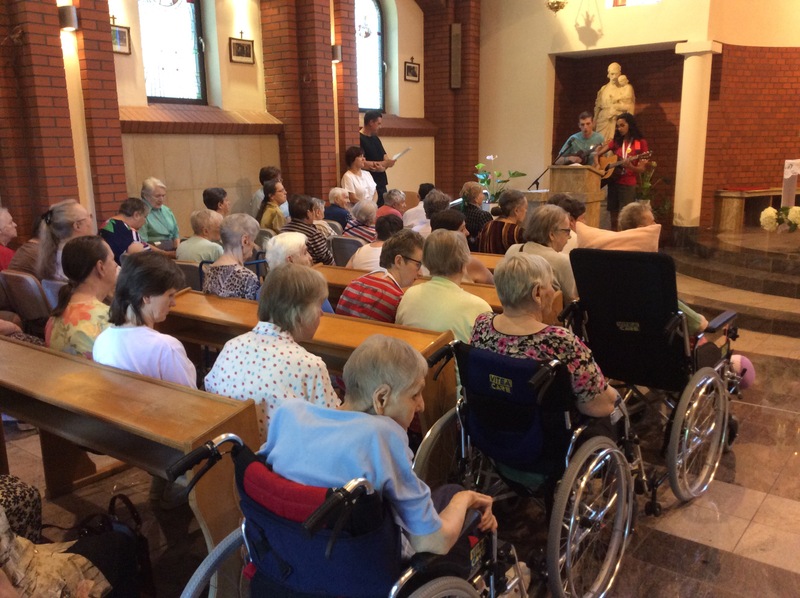 The over 100 residents entertained us with traditional Polish songs and then we in turn sang Praise and Worship music for them. A truly moving visit! And now it was time to eat AGAIN….. We returned to the parish garden to find a sumptuous array of Polish cuisine that would put any Canadian caterer to shame! Following this “light snack” we headed off on public transit to downtown Wroclaw for a tour of the city centre and Market Square. Did I say it was 30 degrees outside! We visited many historical sites in the city centre and then had some fee time in the market area to connect with other pilgrims and hunt for the Wroclaw Gnomes throughout the area…a local art installation. Back on city transit we headed to Mercy Fest ….in a park along the River. 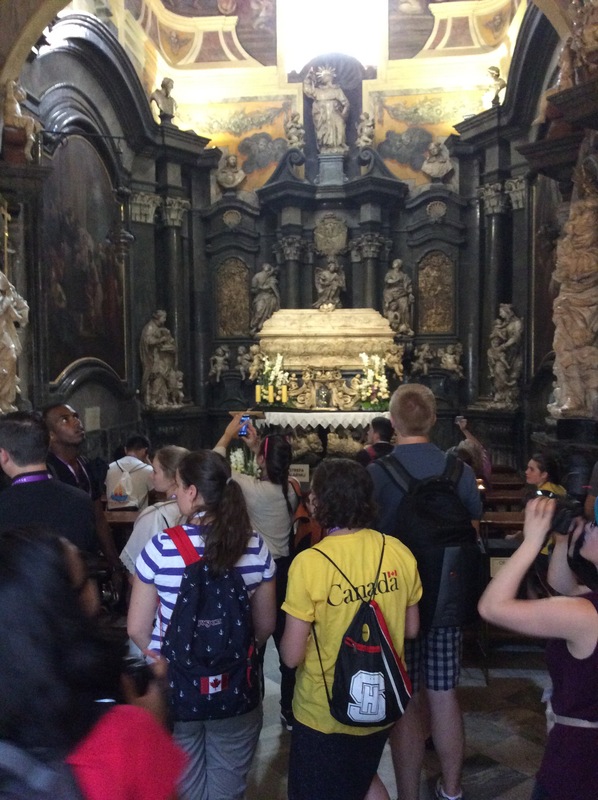 Here we were fed….AGAIN…..and has the chance to listen to some wonderful international music and again connect with other pilgrim groups. Around 7:30 we were back on their terrific transit system and headed back to our host parish were we joined with a neighbouring parish who were hosting a group of pilgrims from Spain for a moving Stations of the Cross where we walked through the town stopping along the route for each station at which there would be a brief reflection from pilgrims in. polish, English and Spanish. This beautiful walk ended at the other parish with Adoration and Reconciliation…..and now to bed…..after we are FED one more time! Tomorrow is another day……Deo Gratias!